Welcome to our Corgi Pet Portraits oil painting of Thomas. 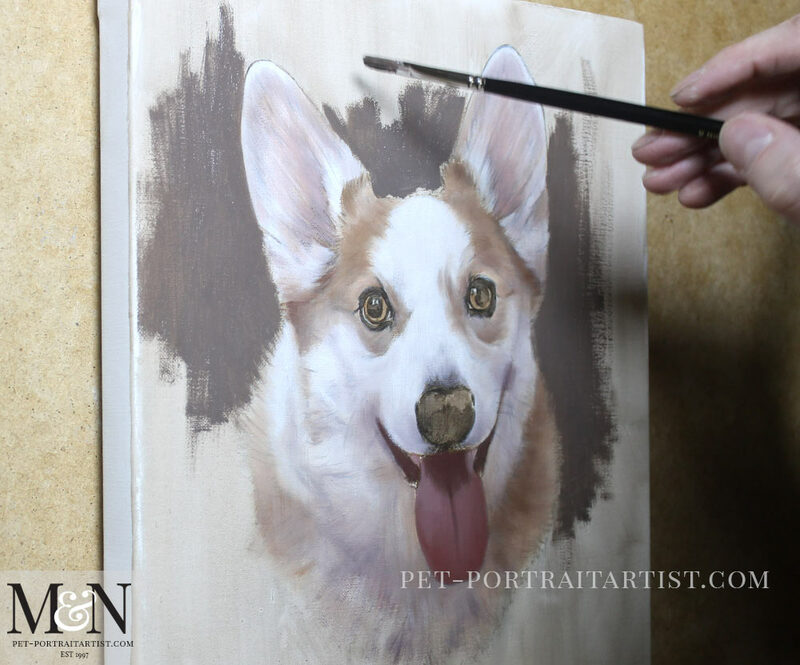 Nicholas has been working really hard on his latest Corgi pet portraits painting, which you can see below. Thomas, the Corgi in question, has been traditionally hand painted in oils by Nicholas on Italian Linen canvas at 12 x 10 size. Thomas headed over to Massachusetts to very happy clients as you can read from the testimonial email below. I took plenty of photos during the paintings process, all of which you can see here. Thomas will be framed with our clients local framer and we are really looking forward to seeing photos of the portrait when its all complete and displayed in our clients home. The portrait of Thomas is awesome! I love it! What a beautiful likeness! My husband will be thrilled! You were wonderful and so professional to deal with. We look forward to the arrival of our portrait of Thomas. Lisa commissioned the portrait of Thomas as a surprise for her husband and we received this wonderful email from him. We are delighted that he loves the painting of Thomas – thats perfect!! What an incredible likeness! How incredibly alive he looks! I have the portrait across from the foot of my bed. Each day I can now wake up and see him. It’s almost as if he’s back! What an absolutely wonderful job you’ve done! Thank you so very, very much! 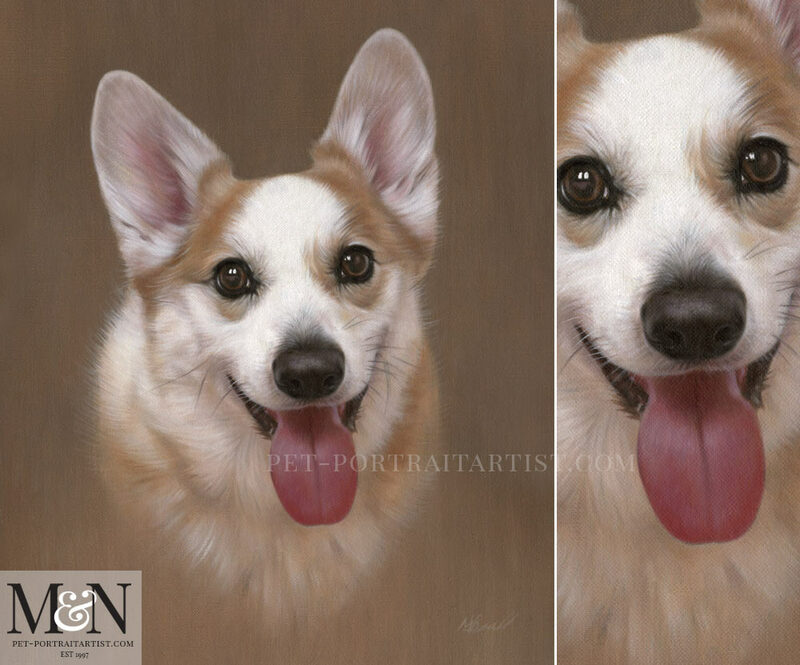 Here is a stages we emailed our client during the Corgi pet portraits process. As you can see Thomas was recognisable right from the very first stage! I managed to get a photo when Nicholas was blocking in the background so you could see. We love to see the canvas half painted like this, they look really arty! The photos we took during the process came out much cooler in colour to the original artwork. It should, however, give our prospective clients an idea of how the whole process works. We hope that you have enjoyed reading about the gorgeous Corgi called Thomas and seeing his portrait come to life. If you would like your Corgi painted or drawn, the head on over to our dog portraits website and contact us today. Send us your photos and tell us all about your Corgi! It’s worderful!!! As all the art you do.